Photos of the Week: We Made It! The First Sure Signs of Spring! J.R.R. Tolkien provided the ideal words to describe the in-between season in which we’re suspended right now: “… a morning of pale Spring still clinging to Winter’s chill.” Spring is officially here with the Spring Equinox, but mornings in the prairies and forests of the township can still feel as though we’re caught in the last weak grip of winter. So this week, I thought I’d be on the lookout for sure signs of spring’s arrival and naturally, once I started looking, they were everywhere! Arriving at Draper Twin Lake Park one cold, gray Sunday, my husband and I heard a very loud, clear rendition of the entire spring song of a Northern Cardinal (Cardinalis cardinalis). (Cardinals have a lot of calls. Listen to the second call listed at this Cornell link – that’s the one we heard.) This fellow seemed confident that he could woo the ladies and establish his territory at the same time with his full-throated singing! Look at that beak! 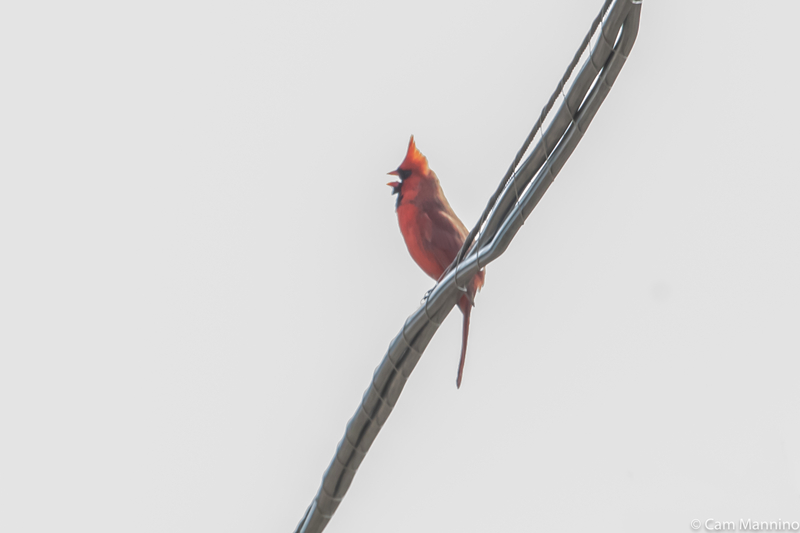 A Northern Cardinal shouts out his spring song! 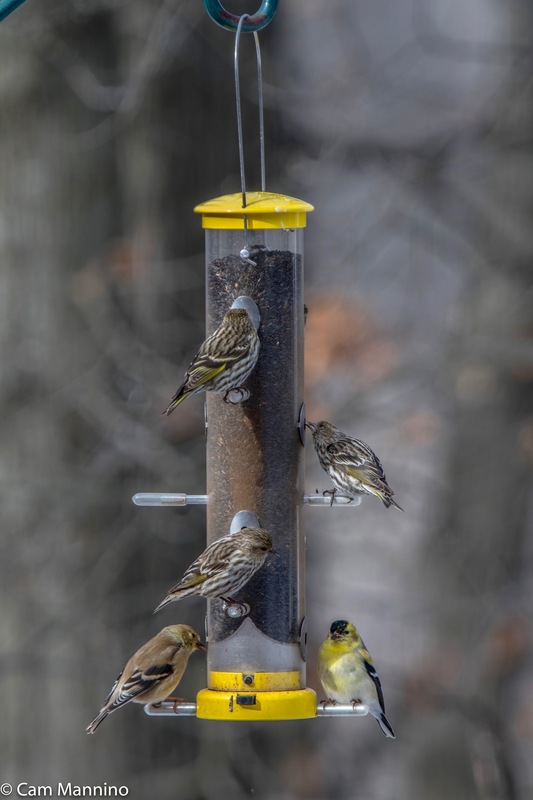 The male Goldfinch on the bottom right perch is signaling spring by changing into his bright yellow breeding feathers. Other birds establish dominance over other males with creative use of their necks! Below two newly arrived Common Grackles (Quiscalus quiscula) appear to be trying to “out-snoot” each other with their beaks tilted skyward! I think the one on the right is probably the winner here, don’t you? Or else the one the left is an uninterested female. It’s hard to tell. 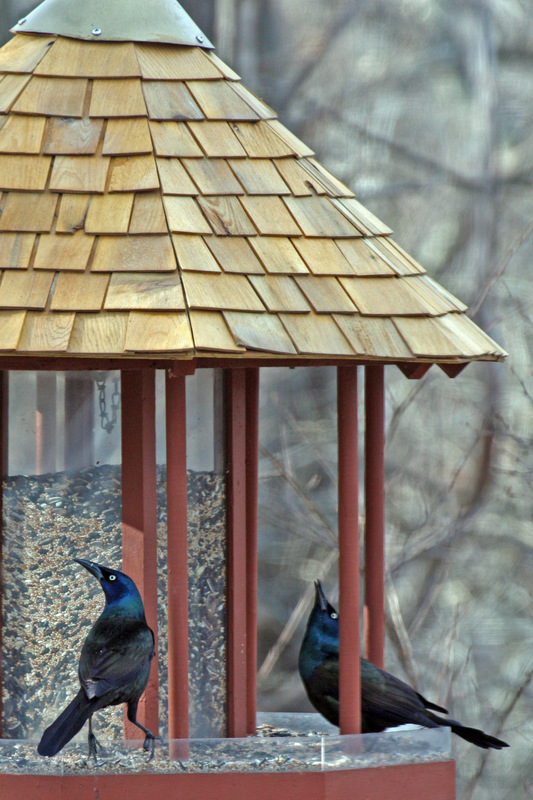 Grackles use head tilting to establish dominance over other males. 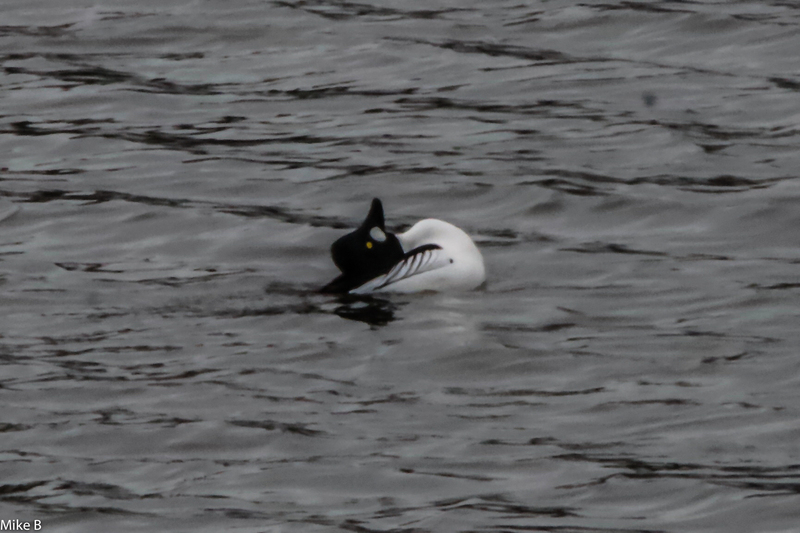 Mark, a birding friend, told me that the Common Goldeneye (Bucephala clangula) at Stoney Creek Metropark were doing their dramatic neck displays as well. According to Cornell Lab’s All About Birds website, Goldeneyes spend December to April in courtship groups where they form mating pairs by performing a lot of energetic neck movements. The male bends his neck backwards until his head lays on his back and then he snaps it forward, splashing water with his feet at the same time! The female responds by lowering her head and swinging it forward. Pretty dramatic courtship! I wasn’t able to get to the Metropark this week, but a kindly photographer from iNaturalist, who goes by Mike B, allowed us the use of this photo of a male taken near Chicago. These diving ducks are headed to their breeding grounds in northern Canada and Alaska, just south of the Arctic. The birding group had an exciting Wednesday at Charles Ilsley Park when two huge flocks of Tundra Swans (Cygnus columbianus) flew overhead! Cornell says that these huge, all white swans with black beaks spent the winter on the Atlantic coast and are now headed to the Arctic tundra to build their nests and breed. Aren’t we lucky to be on their flyway? Another birding friend, Mike Kent, took the photo below, because, wouldn’t you know, that was the day I decided to leave my camera at home!!! Look carefully at Mike’s photo because he caught a fascinating detail. We saw one lone Canada Goose (Branta canadensis) traveling along with this huge flock of swans! You can just see its dark body in the upper left of the photo, third bird down. Hope this adventurous goose doesn’t plan to go all the way to the Arctic with its new-found friends! A huge flock of Tundra Swans with a lone Canada Goose (upper right) traveling with them. Photo by Mike Kent. That Wednesday was great for seeing big birds at Ilsley Park. Mike also caught for us a nice photo of a family of Sandhill Cranes (Antigone canadensis) who settled at the bottom of a slope to rest and feed. The larger, darker birds to the right are probably the adults, while the two smaller gray ones on the left are probably last year’s young ones. A family of Sandhill Cranes at Ilsley park. Possibly adults to the right, last year’s juveniles to the left. Photo by Mike Kent. At Bear Creek Nature Park, smaller flocks were chatting in trees and foraging along the paths. A noisy group of American Robins (Turdus migratorius) were snatching berries from a tree infested with invasive Oriental Bittersweet (Celastrus orbiculatus). 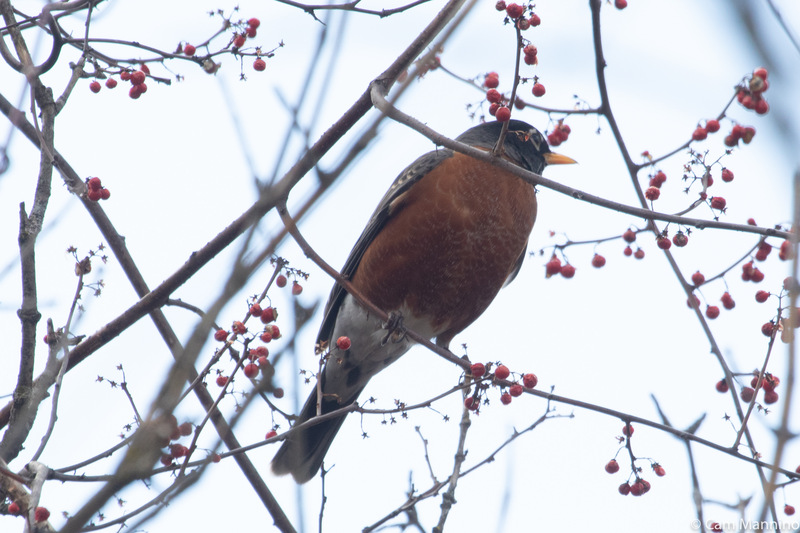 Some robins overwinter here and some migrate to southern Ohio and Kentucky. Some move back and forth all winter long. Though these non-native berries attract them during the winter, they unfortunately don’t provide much nutrition for the birds since thawing and freezing makes them very sugary. So migrating, in their case, might be a better choice! A robin from a larger flock sits among the berries of invasive Oriental Bittersweet. 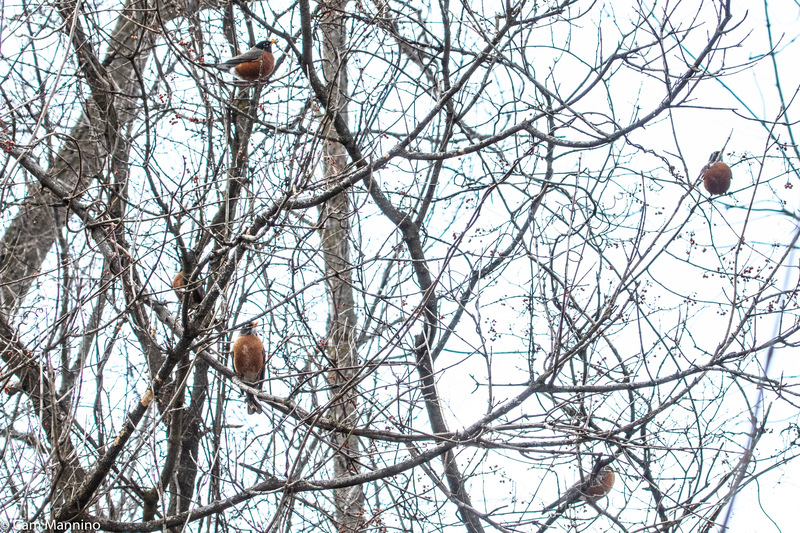 A small part of a flock of probably 20 robins at Bear Creek Nature Park this week. On a path from the playground to the Walnut Lane at Bear Creek Nature Park, I saw my first flock of Song Sparrows (Melospiza melodia). I love to listen to these tuneful birds in the spring, but have never before seen a flock of them in one area, as I did this week. They were “chicken-scratching” by scooting backwards with their feet in a ferocious attempt to get at some food beneath the surface -probably small seeds or insect eggs. The flock was so busy that the ground along the trail looked torn as they scraped their way down to the frozen surface, looking for food. 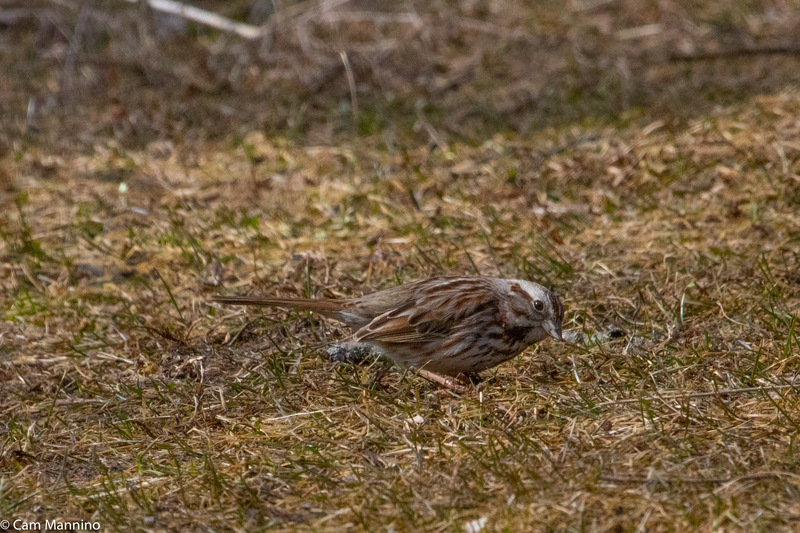 A Song Sparrow, part of a flock on the path at Bear Creek, searched for food by scratching backwards on the soil like a chicken. Every year as spring approaches, I watch the Silver Maple (Acer saccharinum) to the right of the deck at Bear Creek’s Center Pond. It’s always one of the first trees to signal spring for me, its robust, red buds hanging gracefully from drooping branches over the water. 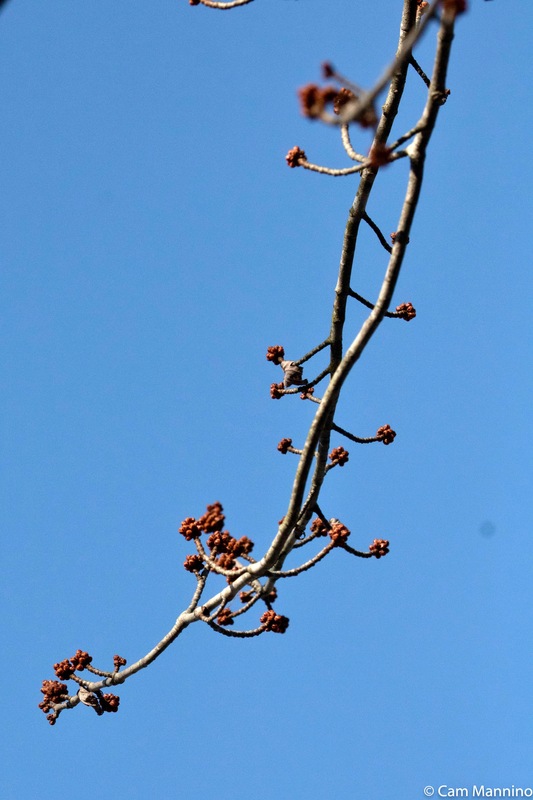 The swelling red buds of Silver Maple are an early sign of spring approaching. The tip of a shagbark hickory bud pokes forth from its woody winter covering. Yes, It’s Muddy…but It’s S’posed to Be, Right? It’s the end of March. Most of the ice on the surface is gone (at least for the moment! ), but the ground is still frozen beneath. So rain and melting snow have nowhere to go. That makes for muddy shoes, smeared pant legs and cars decorated in various shades of brown. But hey, those signs announce that full-fledged, glorious spring is almost here! Birds are beginning to sing, dance, do a bit of neck gymnastics, don spring colors and wing their way north overhead in huge numbers. And trees are slowly waking from their roots, sending sugary sap up through their vascular systems, ripening their leaves for another summer of sun-gathering. 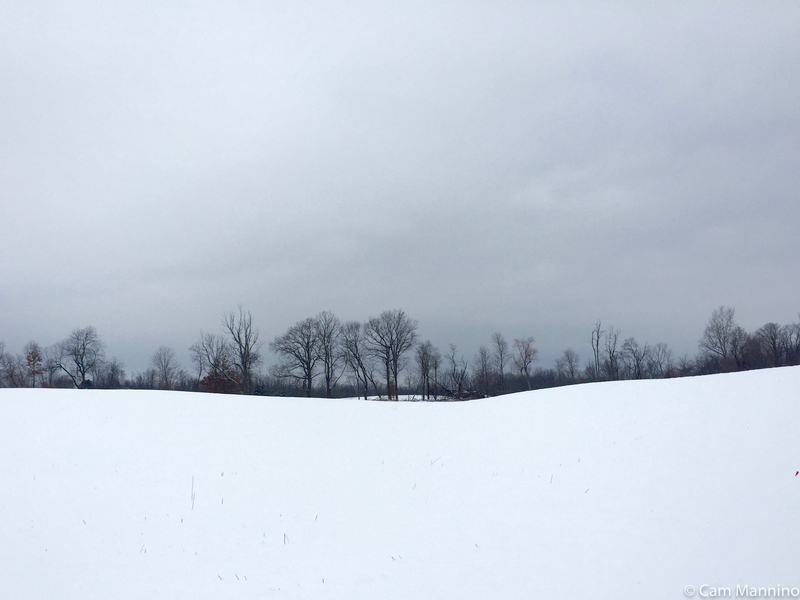 All of nature, including us humans, have survived a very challenging, deep-freeze winter. Now’s the time to celebrate just being alive on a mudluscious walk in the pale sunshine of an early spring morning. 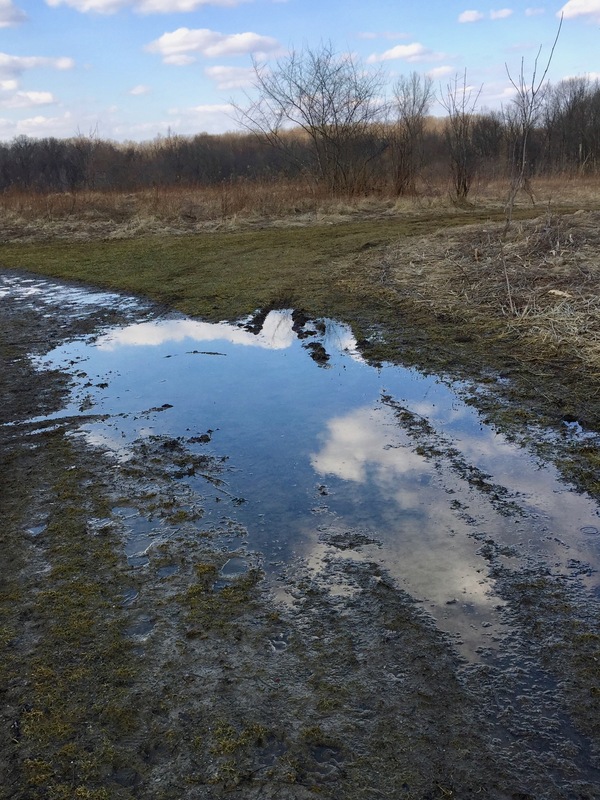 Oakland Township Stewardship Manager Ben VanderWeide and I both got inspired by the idea of a year-end reflection on some of the remarkable sights in our parks and natural areas over the last year. Nature excels in surprising and delighting any curious observer with its ability to come back from adversity, in some cases to even thrive in difficult circumstances. That ability to keep on growing and creating in the face of any obstacle can be a great inspiration in challenging times. 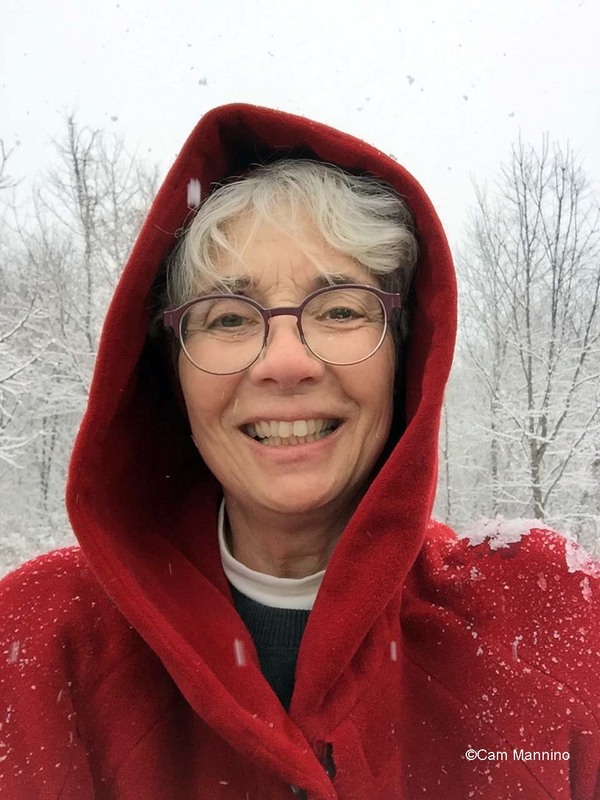 So as the snow falls, please sit back in a comfortable chair with a warm drink and savor some highlights from the four seasons of 2017 here in Oakland Township. Ah, mud-luscious spring! 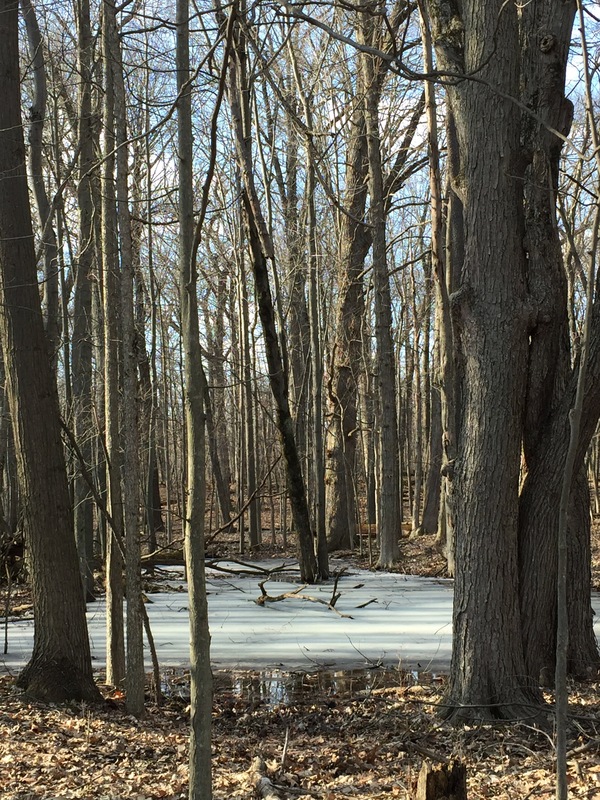 The tiny Chorus and Wood Frogs thawed out after their winter freeze and sang lustily from vernal ponds. In early spring, the birders spotted a crayfish at Bear Creek who’d climbed out of her chimney with eggs under her tail and was lumbering toward the pond. Some spring avian migrators quickly passed through, and we bird watchers were lucky to spot a few special visitors. An unusual American Pipit appeared before my camera lens one afternoon at Gallagher Creek Park on its way to its breeding grounds in the far north. While others, like the Tree Swallow or the Eastern Meadowlark, settled in for the summer to raise their young. 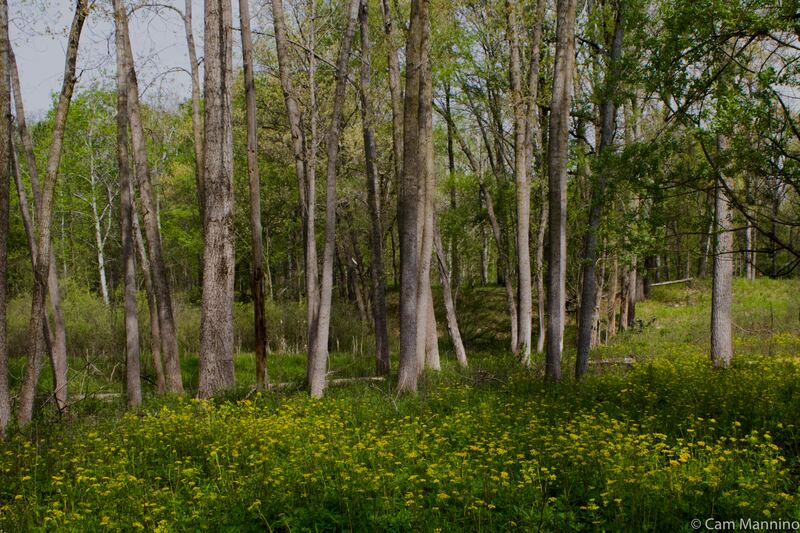 After last year’s controlled burn, native Lupines appeared along the Paint Creek Trail. And in May, Ben spotted a rare sight, a frilly spread of rare Bogbean flowers in a kettle wetland at Bald Mountain State Recreation Area off Kern Road. Snow melt and bright green buds always offer an irresistible invitation to come out and join the bustle and music of spring! Summer! The very word conjures up a coloring box assortment of butterflies hovering over prairie wildflowers. Birds constructed their nests and later wore themselves out feeding noisy, demanding fledglings. We birders particularly enjoyed close looks at a male Rose-breasted Grosbeak sharing egg-warming duties near a Bear Creek path. The birders laughed in surprise watching a passive/aggressive pair of Canada Geese successfully discourage the presence of a Green Heron by simply swimming uncomfortably close to it. A family ambled along a path at Draper Twin Lake Park, headed for a morning fishing expedition. The birding group, binoculars in hand, spotted an Indigo Bunting while walking the new paths through the prairies at Charles Ilsley Park, increasingly spangled with colorful native wildflowers as restoration proceeds. A Great Horned Owl stared at the delighted birding group through a scrim of leaves near Bear Creek marsh. Every path in the township hummed with life during the summer months. But that’s what we all expect of summer, right? 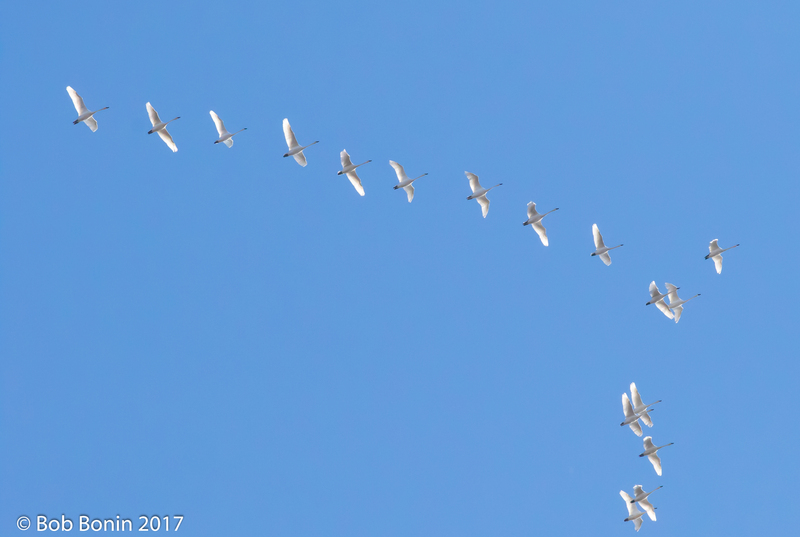 Tundra Swans flew in formation overhead, as migrators of all kinds, like the Hermit Thrush, rode the north wind down to southern climes. But as they departed, nature offered a consolation. Many native wildflowers bloomed in the cool weather as they faithfully do each year. Asters formed carpets of color everywhere, from meadow to marsh! At the Wet Prairie on the Paint Creek Trail, tiny Ladies Tresses orchids, Grass of Parnassus with its delicately striped petals, and vivid purple Fringed Gentian intrigued me again by emerging in the chill of early autumn. Native bumblebees pushed their way into Bottle Gentian flowers at Gallagher Creek Park and the Wet Prairie. Butterflies still sipped nectar from late fall blooms. The birders identified ducks of all kinds assembled in rafts on Cranberry Lake. Rattling cries alerted me to the presence of Belted Kingfishers who scouted for prey at both Bear Creek’s pond and Cranberry Lake. Ben dipped his net into a marsh at Charles Ilsley Park to show us tadpoles that overwinter on the muddy surface beneath the water. So much life as the year 2017 began to ebb! Parks Full of Life All Year ‘Round. Aren’t We Lucky? 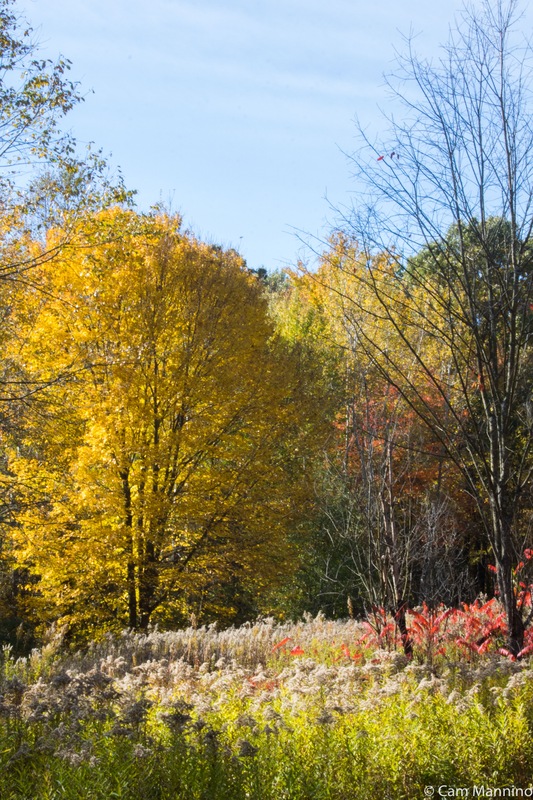 As a direct result of the foresight of township residents who have supported the Parks Commission and land preservation, native plants, wildlife, birds, and a beautifully diverse combination of habitats are being restored and preserved in Oakland Township. I want to share my appreciation for that foresight and for the hard work and knowledge of Ben VanderWeide (my kind and able supervisor and editor), other parks volunteers, my fellow birders and park staff. And at the end of the year, I thank all of you who read, comment on and/or follow Natural Areas Notebook. It’s wonderful to be learning more all the time about the natural world – and then to have this opportunity to share what I’m learning with all of you. On to 2018! As the township birding group departed Cranberry Lake Park last week, the bugling call of Tundra Swans (Cygnus columbianus) filtered down through the frosty air. Looking up, Ben drew our attention to a huge V-shaped flock of striking black and white birds arrowing across the cold November sky. Gifted local photographer Bob Bonin quickly captured this very special sighting . A large flock of Tundra Swans called from a blue sky on a cold November morning at Cranberry Lake Park. The Tundra Swans are so-named because they spend the summer on their breeding grounds above the tree line on the Arctic Circle. On river deltas, near large bodies of water, they build their nests on the chilly ridges formed by the thawing and freezing soil. During the 24 hour sun of an arctic summer, they feed themselves and their young on the lichens, mosses, and grasses of upland or wet meadow tundra. When the long dark of a far north winter started to set in, the swans we saw began their journey south. They passed over our area along their route, likely on their way to the eastern coast of the United States for the winter months. The American Tree Sparrow has arrived from its summer breeding grounds on the Arctic Circle and will spend the winter with us. So while we humans may grouse about cold winter days, birds from the arctic must find our area quite balmy. 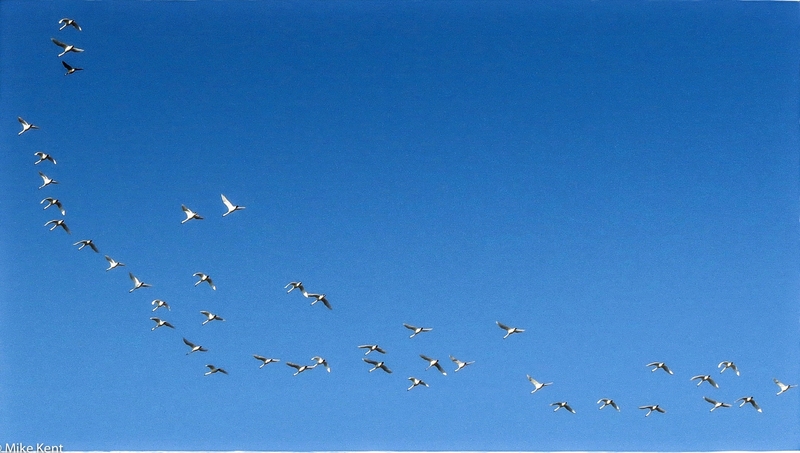 High above, magnificent Tundra Swans wing their way to America’s east coast, bugling cheerfully along the way. 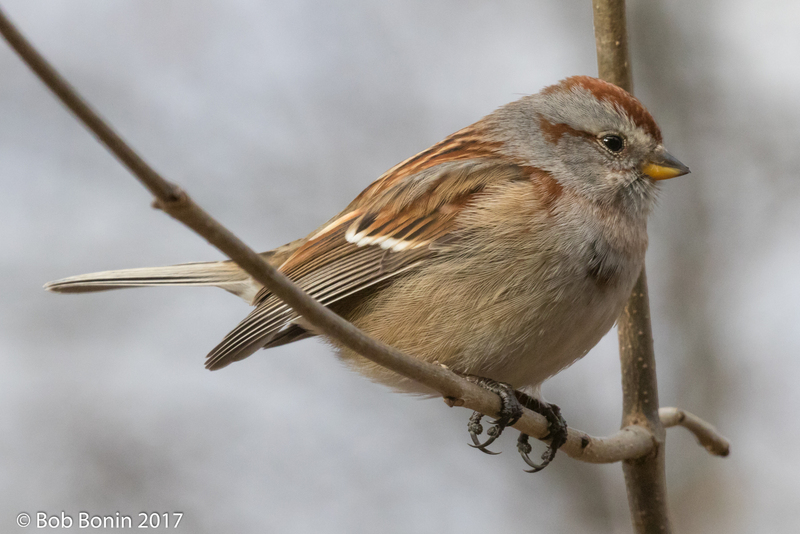 And humble Tree Sparrows, leaving behind a dark, frigid arctic winter, treat the blizzards of a Michigan winter like a Florida vacation! Everything, as they say, is relative.